Head for the UKZN Centre of Jazz & Popular Music at 18h00 tomorrow (August 29) for some beautiful music from Sheila Khumalo & Sheila da Blue Note, accompanied by some poets. Some of the international speakers from the KZN Music Imbizo will be present before they attend the conference which starts on August 31 at the Moses Mabhida Stadium. 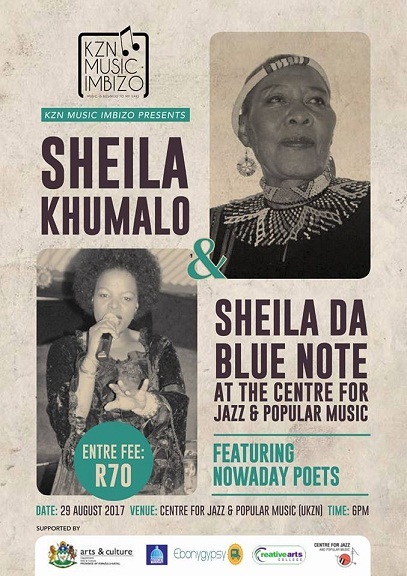 Sheila Da Blue Note is a singer; composer; actress and a dancer. She started her career in 1996 as a gospel singer like any artists. She worked with Lucky & friends and Clermont Merry Singers. Through the love and passion of arts in 2004; she moved to Bat Centre in Durban where she was part of a programme called Artist in Action Residence Programme. She studied composition; ensemble, music theory, voice and music business. She also learned under the jazz legendary Theo Bophela; where she was advancing herself in music theory. She is now in studio recording her debut album. In 2008, she started her solo career under the name of Sheila Da Blue Note. She specializes on Afro Jazz; Pop and Blues; at the same time became a product of Gcugcwa Creative Productions where she learned stage presentation. Sheila Khumalo began her music career at an early age and was discovered by John Shawman of the Sheperds Music Group when she was 19. In the 1980’s and 90’s she got more involved in the music scene as a back-up singer for many famous musicians in Johannesburg such as Joyce Thabe and the Boots, and Sophie Mgcina. She did many productions and toured all of South Africa, growing her horizons and experimenting with her acting skills. She has been very giving of her skills, participating in many of the HIV/AIDS drives, as well as through the passing down of her performance skills to young children from her community of KwaMashu. Tickets R70 at the door. The Centre for Jazz & Popular Music is housed on level 2 of the Dennis Shepstone building on the Howard College campus.